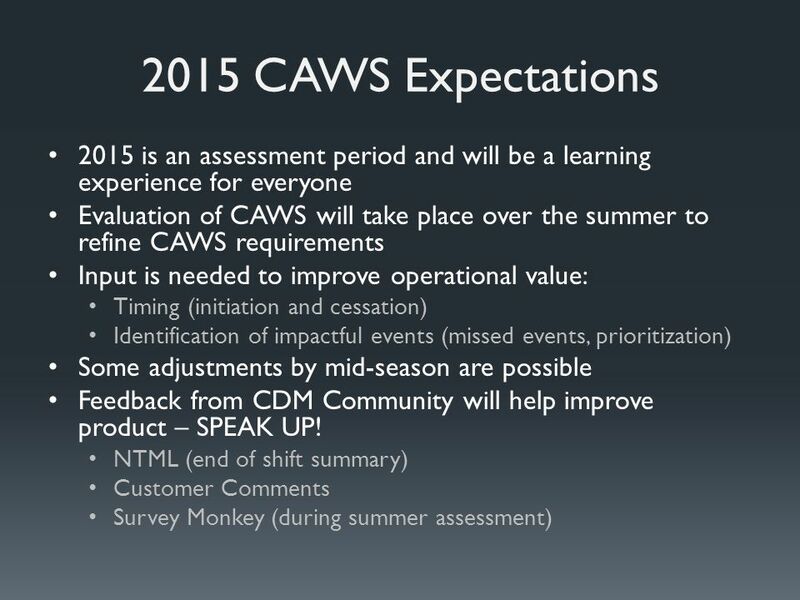 CCFP and CAWS WET Date: Spring 2015. 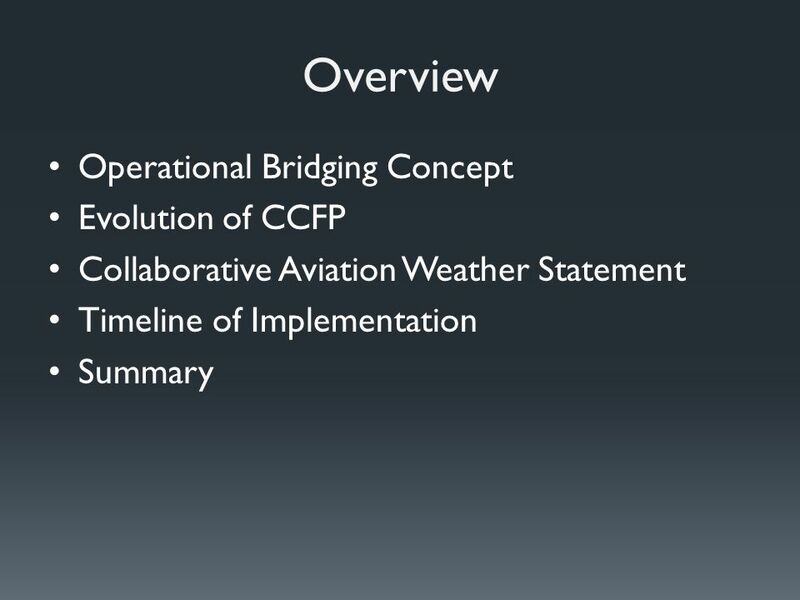 Overview Operational Bridging Concept Evolution of CCFP Collaborative Aviation Weather Statement Timeline of Implementation. 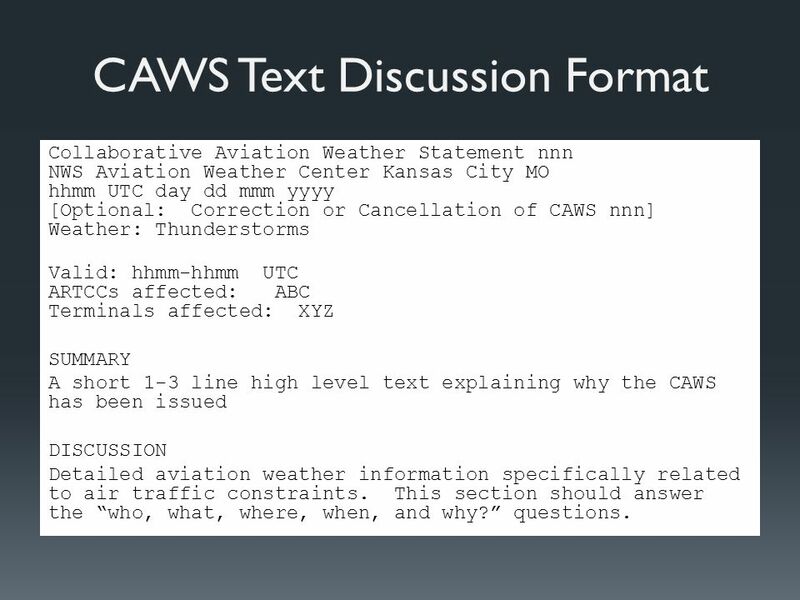 24 CAWS Text Discussion Format Collaborative Aviation Weather Statement nnn NWS Aviation Weather Center Kansas City MO hhmm UTC day dd mmm yyyy [Optional: Correction or Cancellation of CAWS nnn] Weather: Thunderstorms Valid: hhmm-hhmm UTC ARTCCs affected: ABC Terminals affected: XYZ SUMMARY A short 1-3 line high level text explaining why the CAWS has been issued DISCUSSION Detailed aviation weather information specifically related to air traffic constraints. 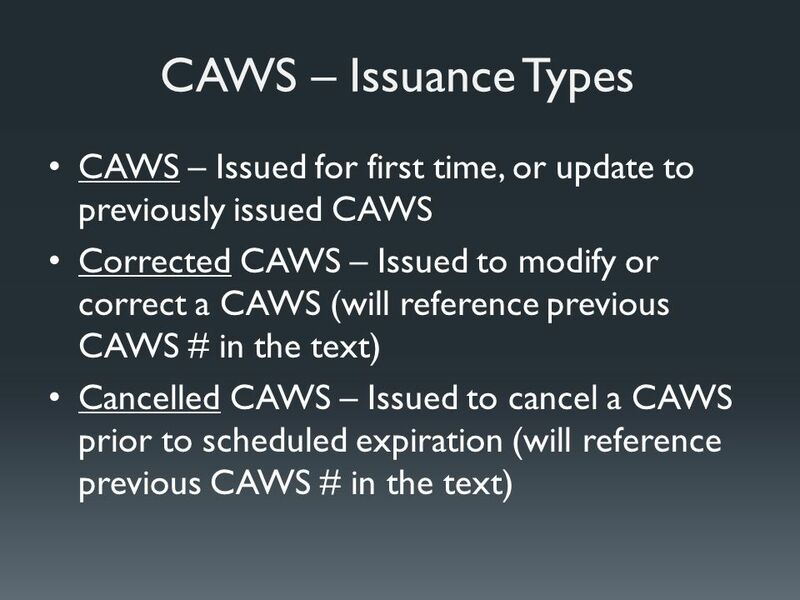 This section should answer the “who, what, where, when, and why?” questions. 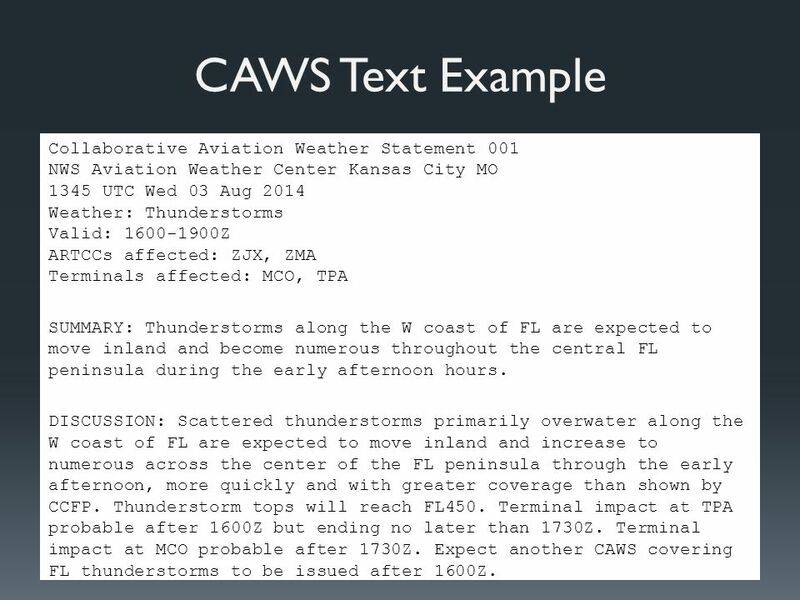 25 CAWS Text Example Collaborative Aviation Weather Statement 001 NWS Aviation Weather Center Kansas City MO 1345 UTC Wed 03 Aug 2014 Weather: Thunderstorms Valid: 1600-1900Z ARTCCs affected: ZJX, ZMA Terminals affected: MCO, TPA SUMMARY: Thunderstorms along the W coast of FL are expected to move inland and become numerous throughout the central FL peninsula during the early afternoon hours. 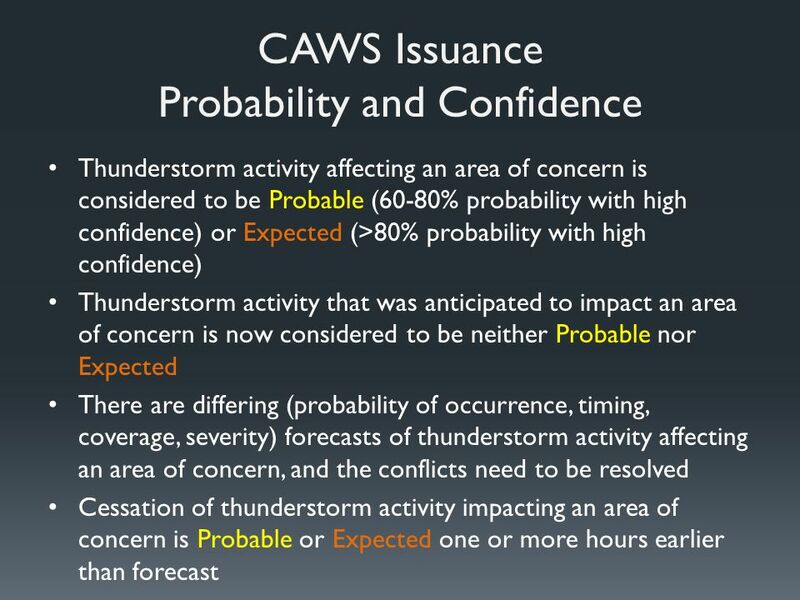 DISCUSSION: Scattered thunderstorms primarily overwater along the W coast of FL are expected to move inland and increase to numerous across the center of the FL peninsula through the early afternoon, more quickly and with greater coverage than shown by CCFP. 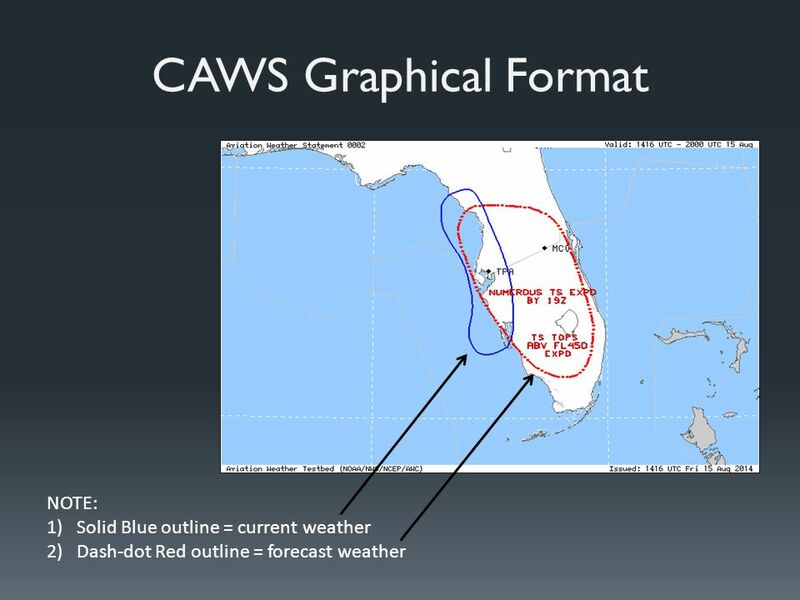 Thunderstorm tops will reach FL450. 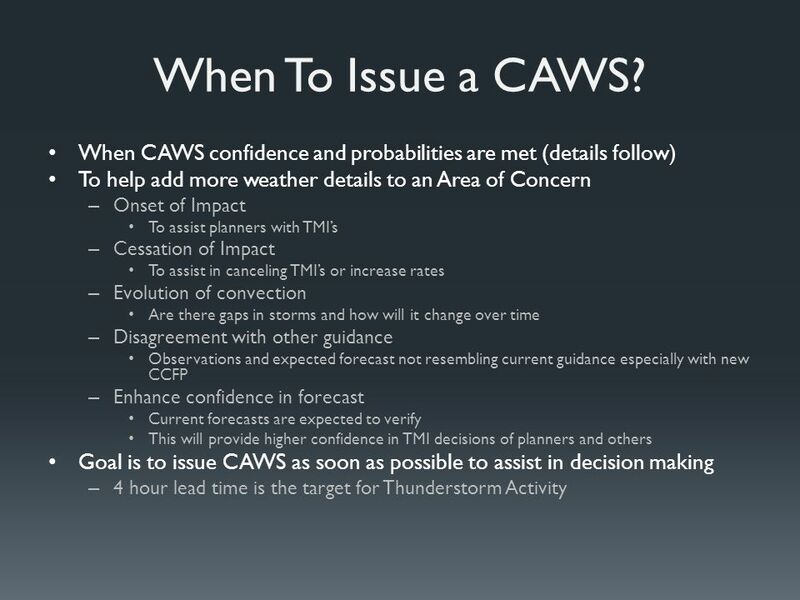 Terminal impact at TPA probable after 1600Z but ending no later than 1730Z. 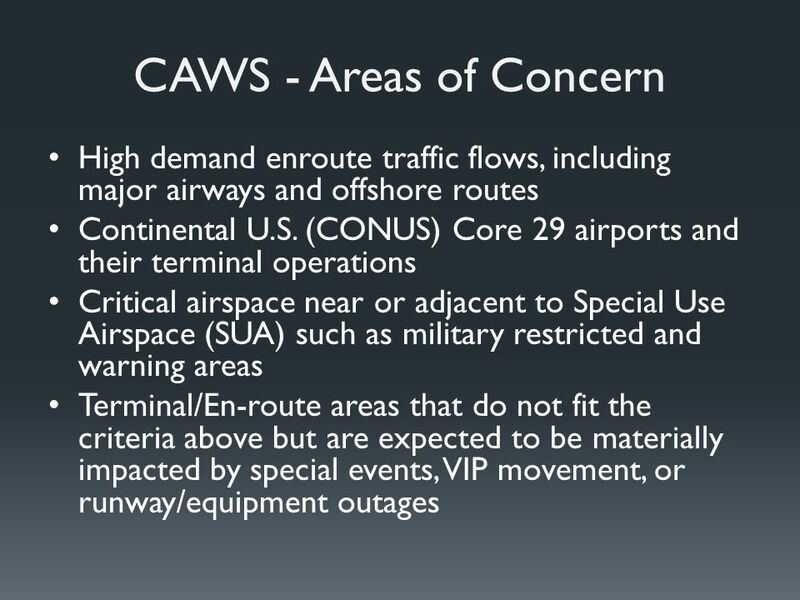 Terminal impact at MCO probable after 1730Z. 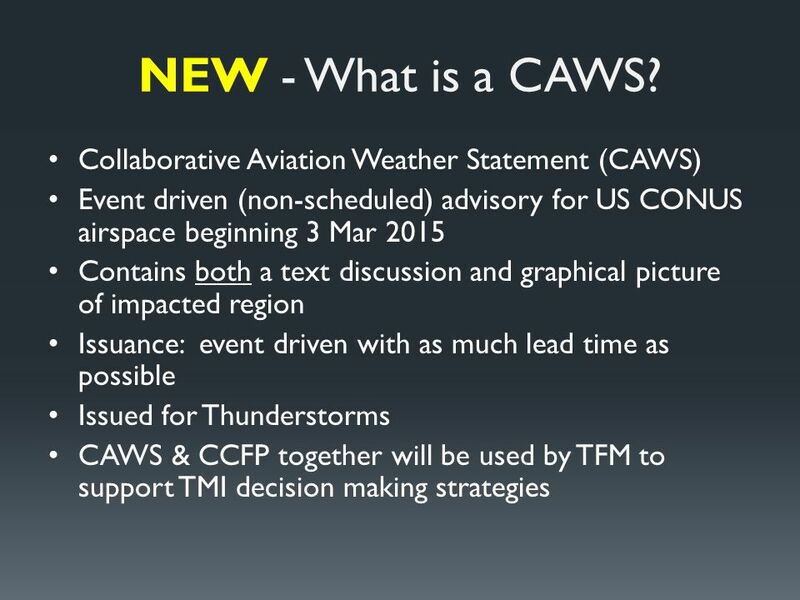 Expect another CAWS covering FL thunderstorms to be issued after 1600Z. 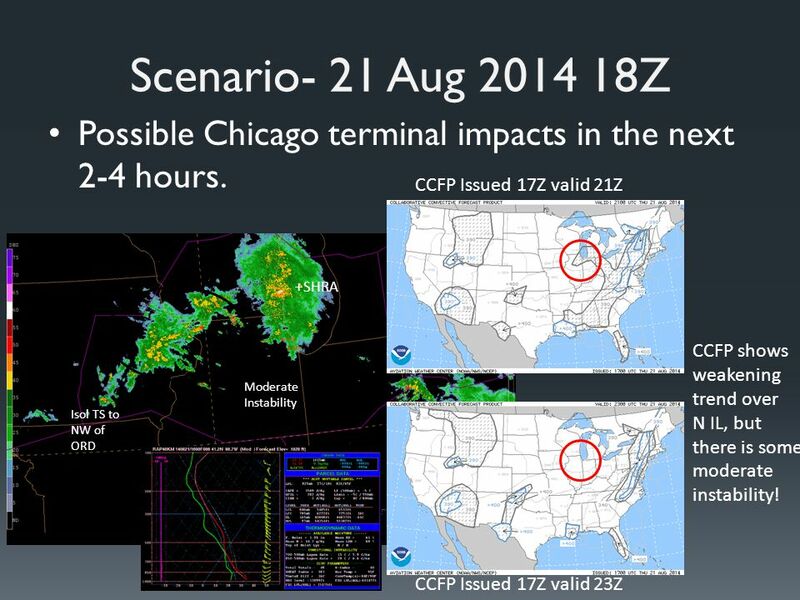 28 Scenario- 21 Aug 2014 18Z Possible Chicago terminal impacts in the next 2-4 hours. 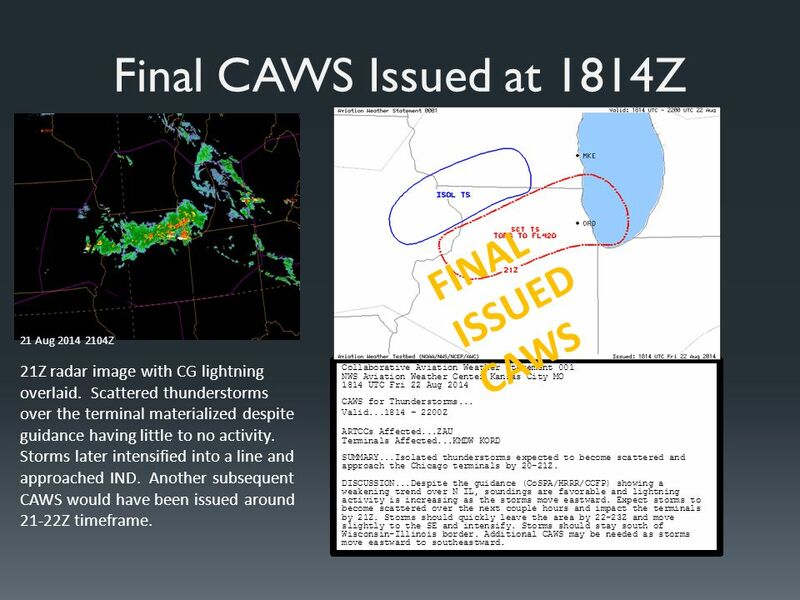 Isol TS to NW of ORD +SHRA CCFP Issued 17Z valid 21Z CCFP Issued 17Z valid 23Z Moderate Instability CCFP shows weakening trend over N IL, but there is some moderate instability! 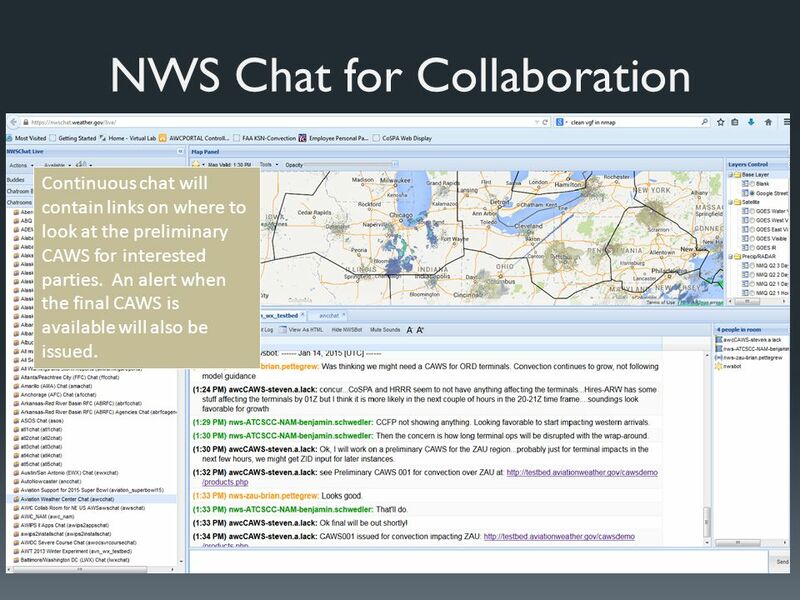 29 NWS Chat for Collaboration Continuous chat will contain links on where to look at the preliminary CAWS for interested parties. 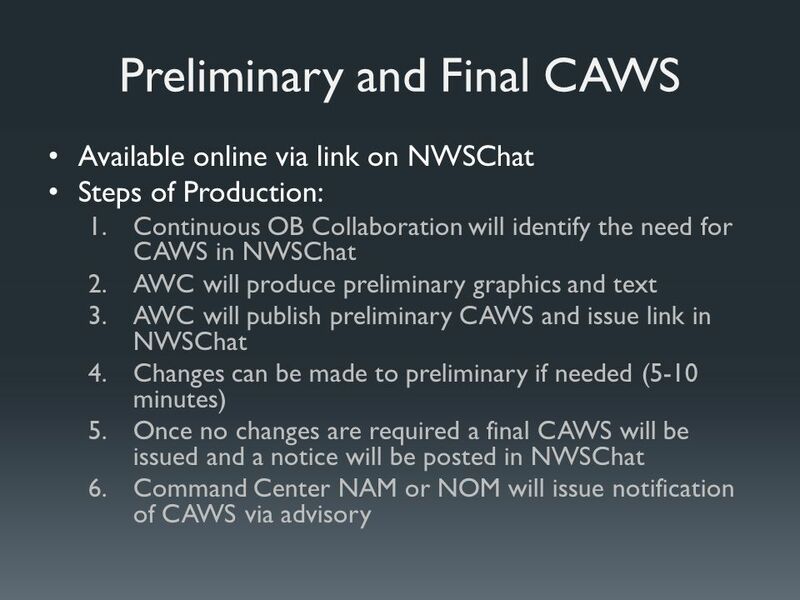 An alert when the final CAWS is available will also be issued. 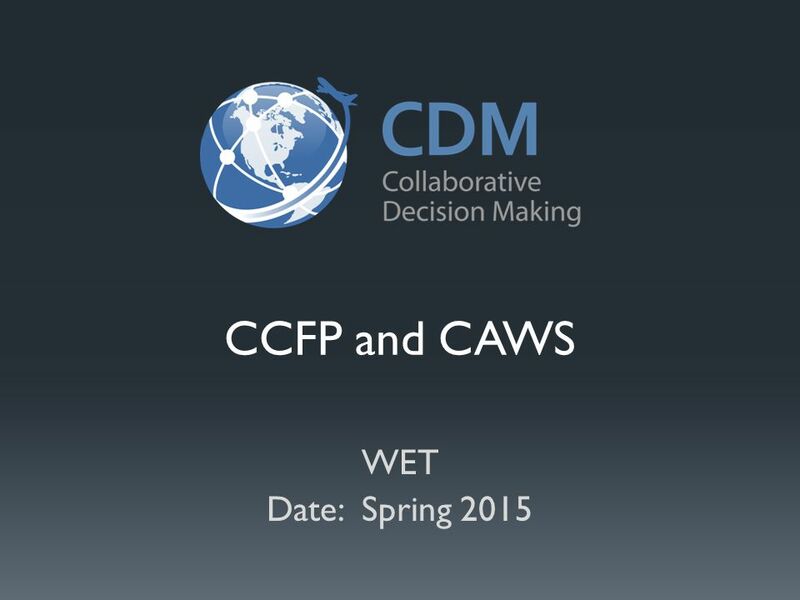 Download ppt "CCFP and CAWS WET Date: Spring 2015. 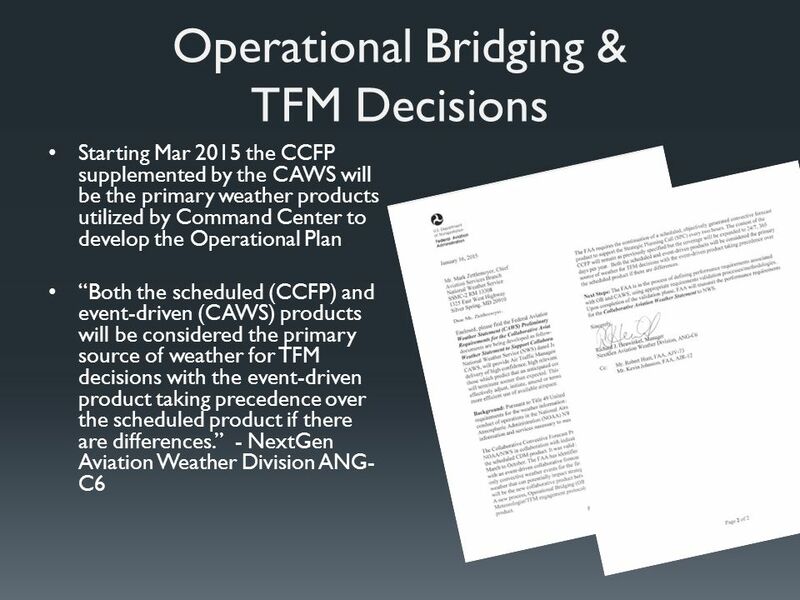 Overview Operational Bridging Concept Evolution of CCFP Collaborative Aviation Weather Statement Timeline of Implementation." 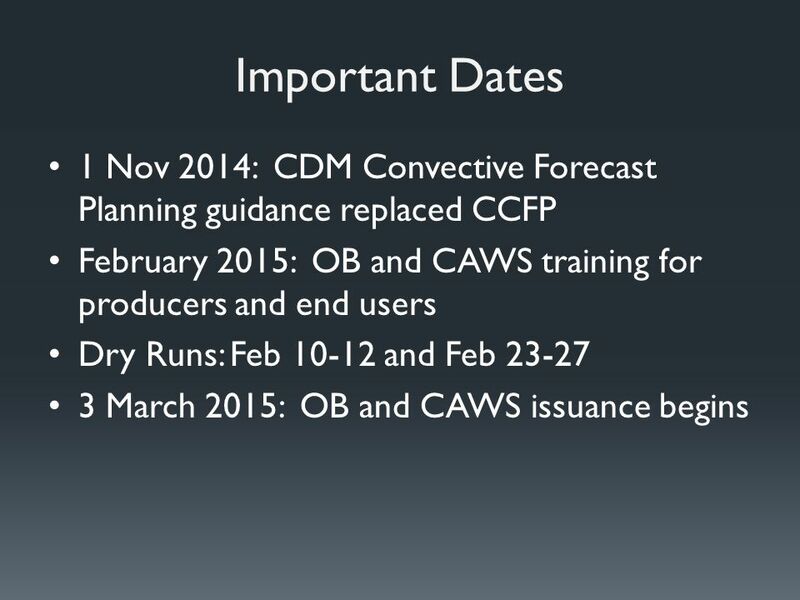 1 CCFP 2014 Overview of the Collaborative Convective Forecast Product NOAA/NWS/Aviation Weather Center Jan 30, 2014. 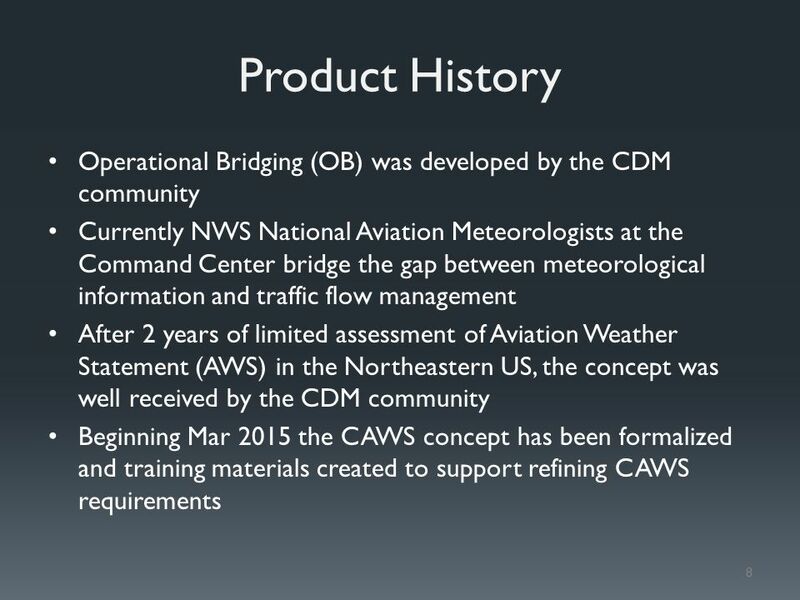 The Evolution of NWS Aviation Weather Services in Chicago Mike Bardou National Weather Service Chicago The views expressed in this presentation are those. 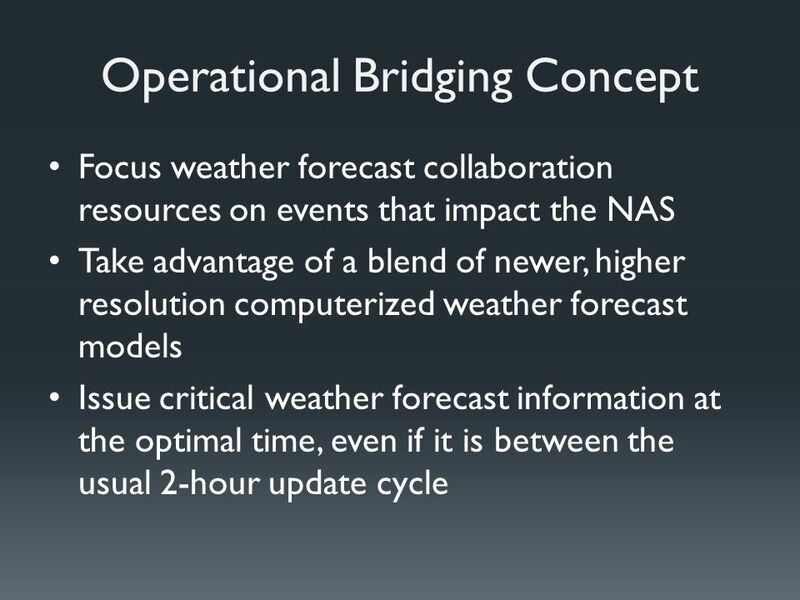 WEATHER DECISION- MAKING PRIORITIES: AN AOC PERSPECTIVE TOM LLOYD | MANAGER METEOROLOGY & ROUTE OPTIMIZATION/AIR TRAFFIC SYSTEMS. 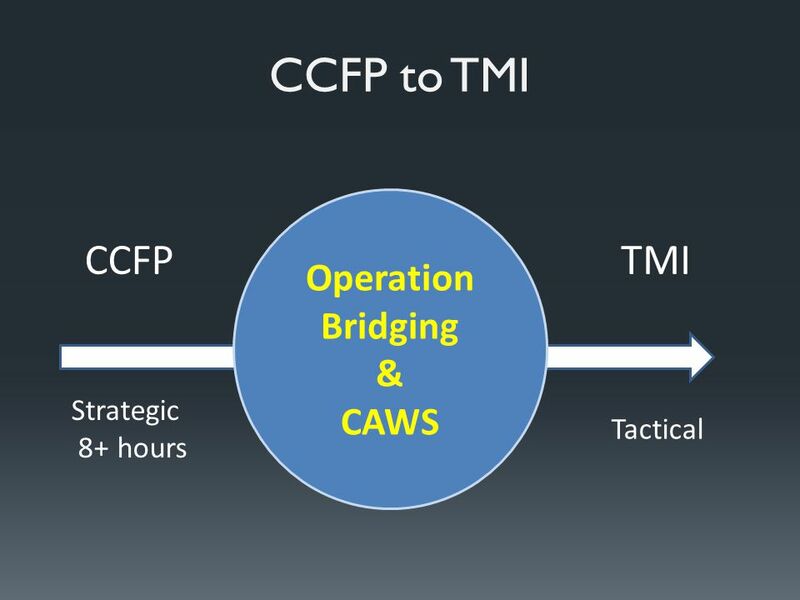 Aviation User Training: TAF Interpretation and Supplemental Products. February 25, 2011 Demand Side Working Group EILS Update Mark Patterson ERCOT, Manager Demand Integration. 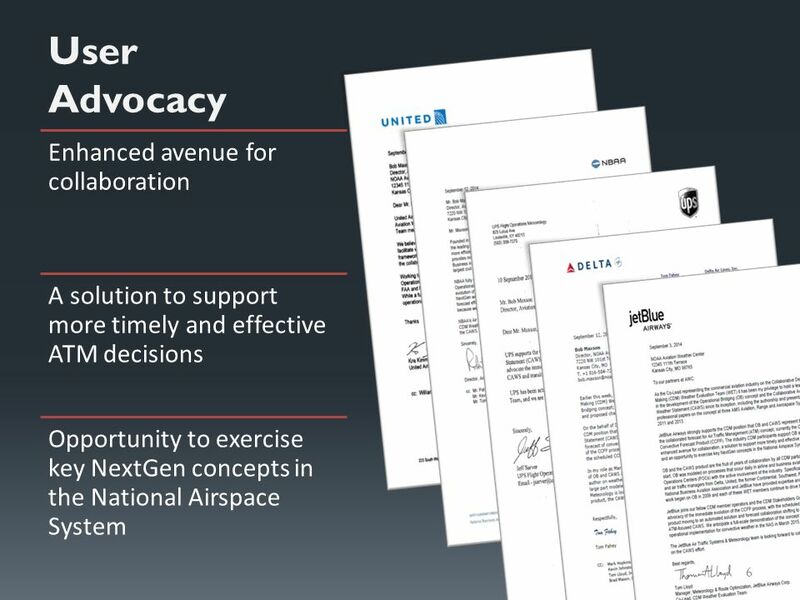 Federal Aviation Administration 1 June 2013 Federal Aviation Administration 1 October 2013 WET Update to NBAA and FPAW Federal Aviation Administration. 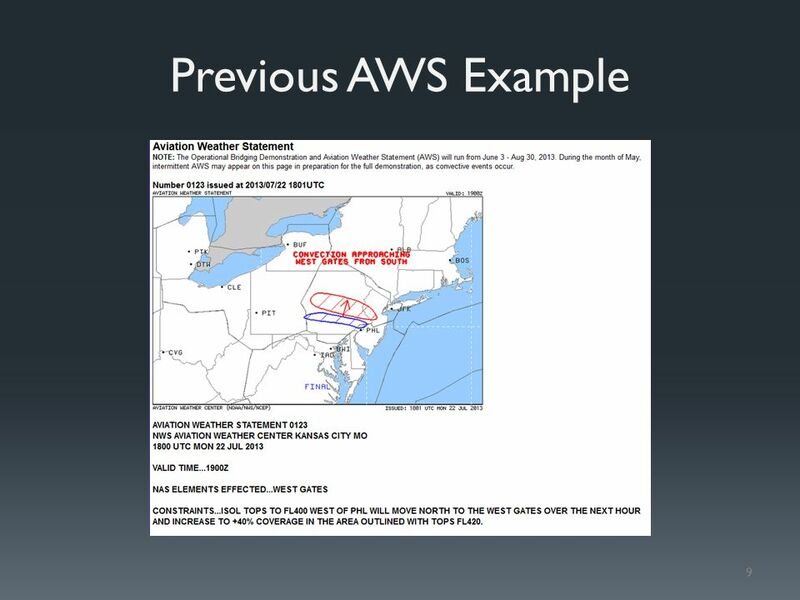 Lead Time Aviation Verification Onset and Cessation of Ceiling and Visibility Flight Category Conditions (IFR, MVFR, VFR) at FAA Core Airports NWS Aviation. 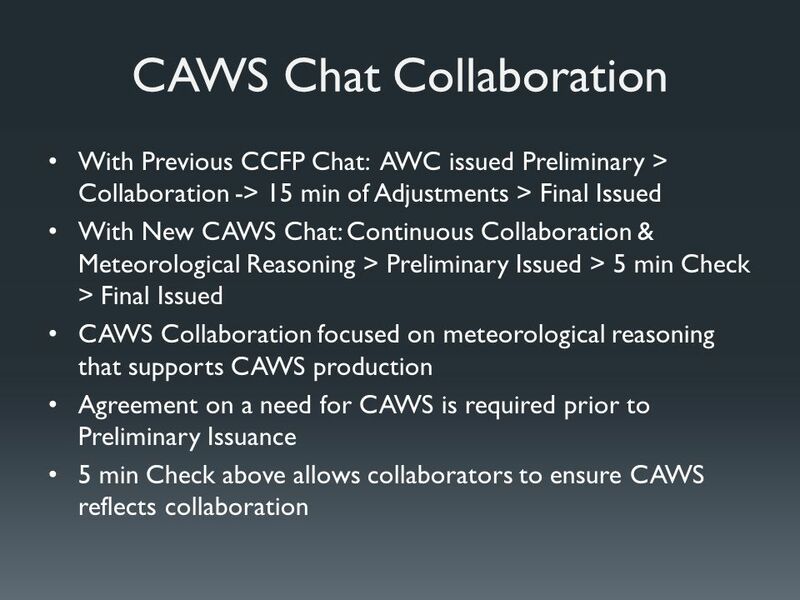 CCFP and CAWS WET Date: Fall Overview Evolution of CCFP Collaborative Aviation Weather Statement Timeline of Implementation Summary. 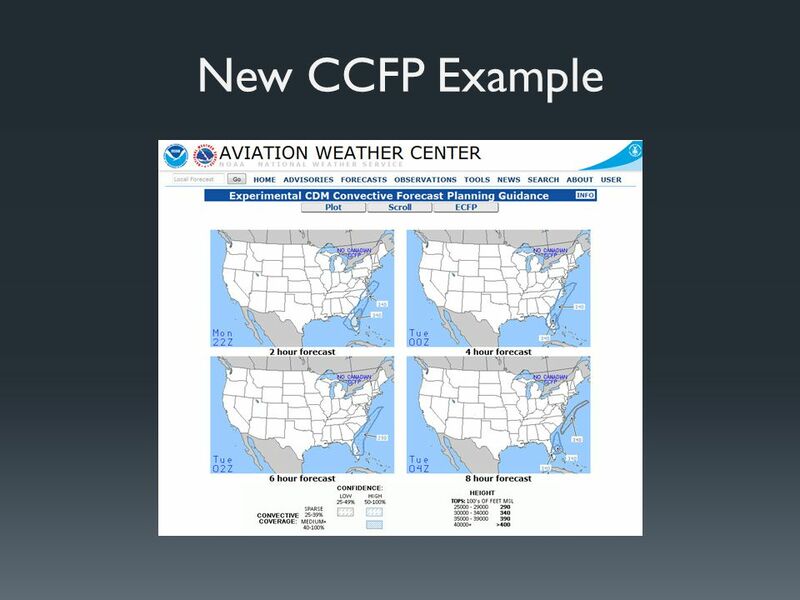 CCFP COLLABORATIVE CONVECTIVE FORECAST PRODUCT TRAINING SPRING 2005. 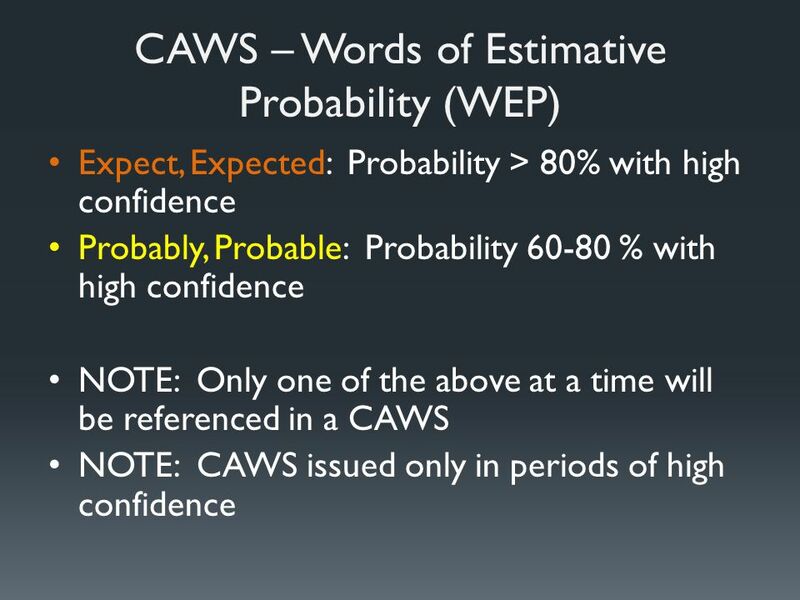 Aviation Meteorology A Northwest Airlines Perspective Tom Fahey, Manager Meteorology American Meteorological Society - Memphis Chapter 20 September 2005. 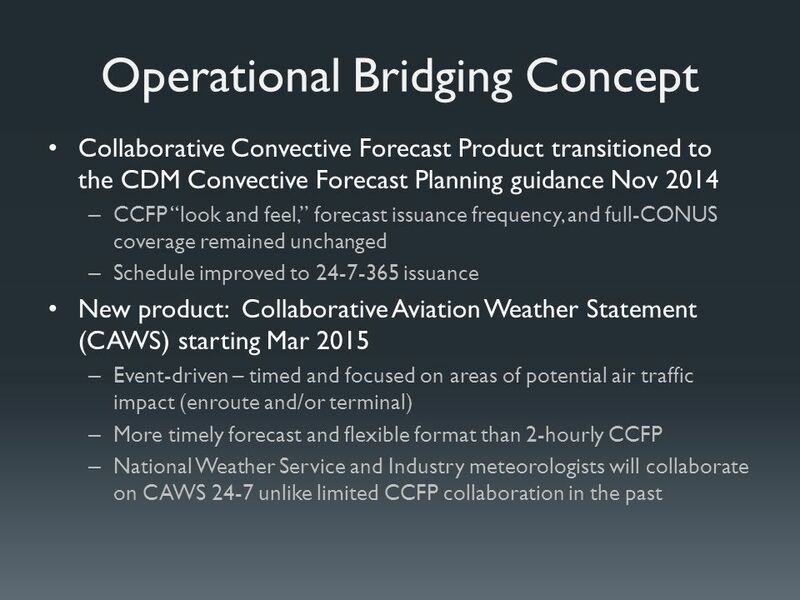 Next Generation Air Transportation System (NextGen): Wx Integration Ray Moy New Weather Concept Development Branch FAA, Aviation Weather Division, ANG-C62. 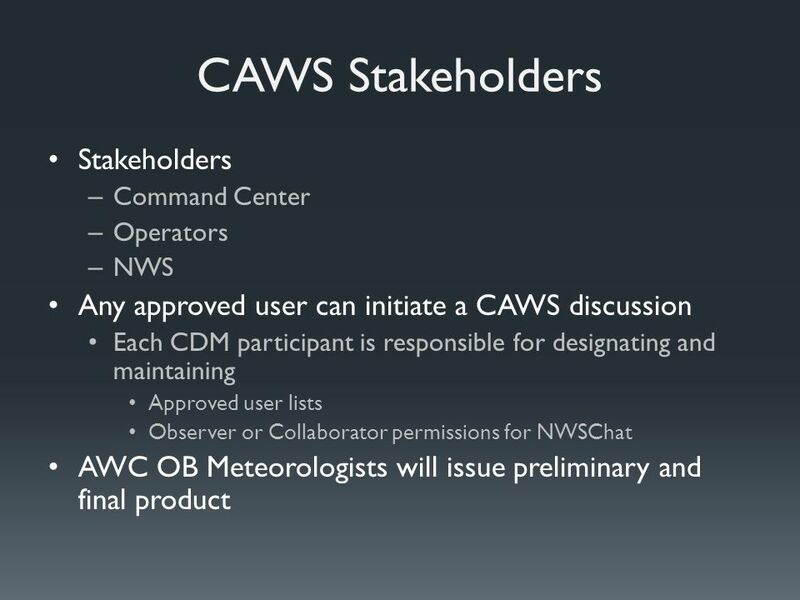 World Meteorological Organization Working together in weather, climate and water NextGen Update WMO; CAeMwww.wmo.int WMO. 1 AvMet Applications, Inc Alexander Bell Dr., Ste. 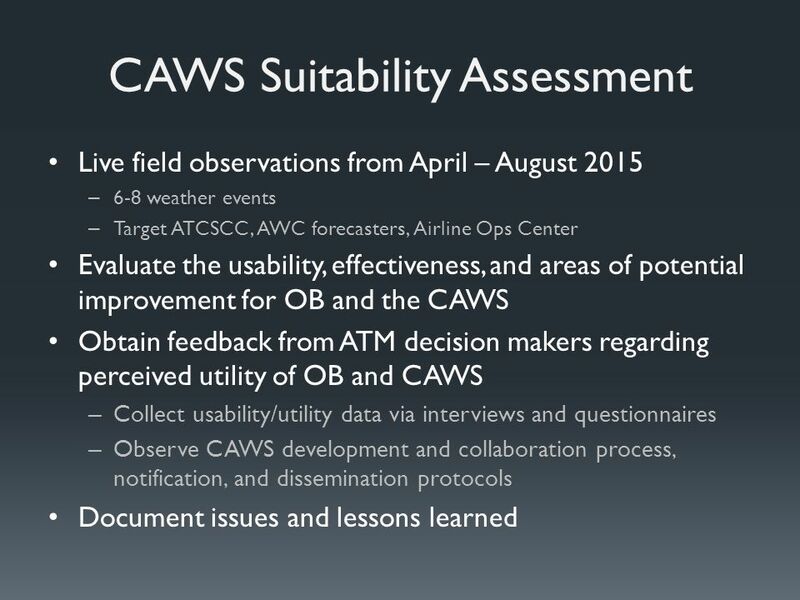 130 Reston, VA Applying FAA Aviation Weather Metrics Program Research to Operational Benefits. 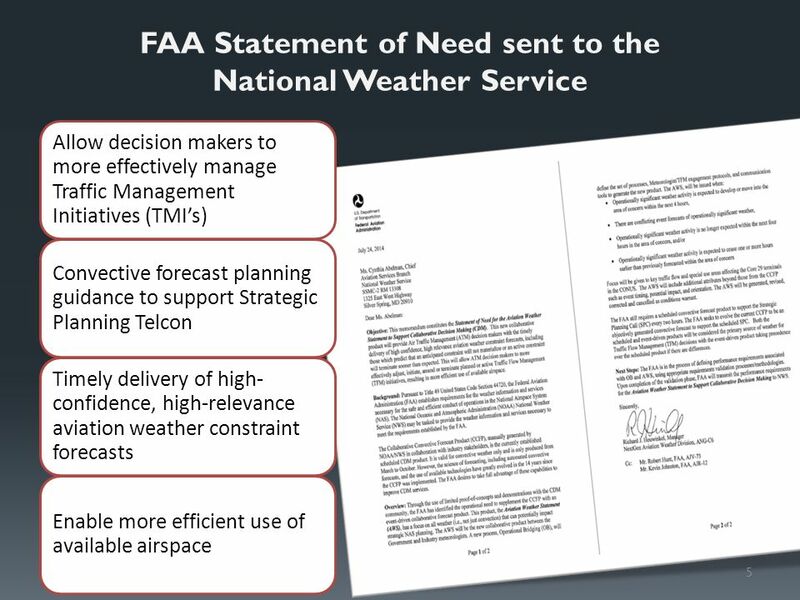 FAA Stated Requirements “ The goal is to substantially improve the capabilities for delivery of aviation weather information and to transform the current. 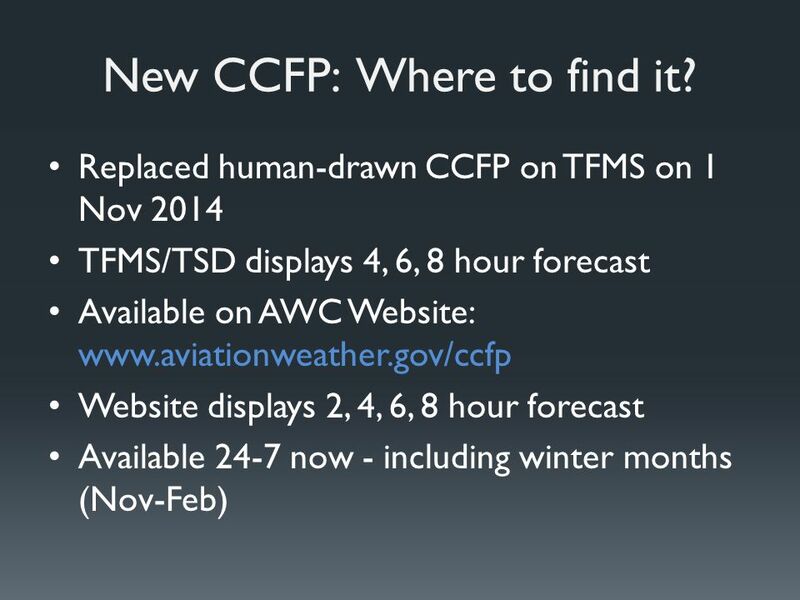 Warm Season Aviation Weather and Resources National Weather Service Chanhassen, MN Center Weather Service Unit Farmington, MN. 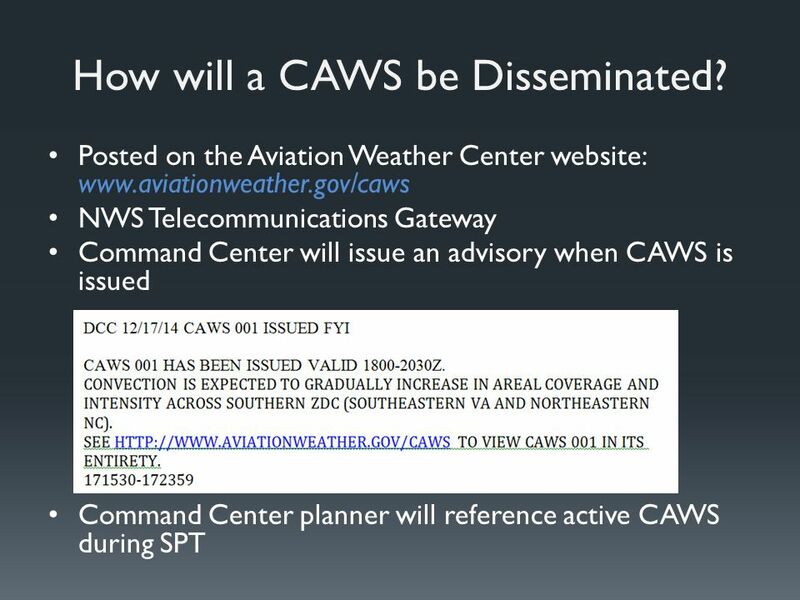 Changes to Aviation Weather Center Products/Services Collaborative Aviation Weather Statement Automated CCFP Area Forecasts Replaced with Hi- res SIGMET/AIRMET. 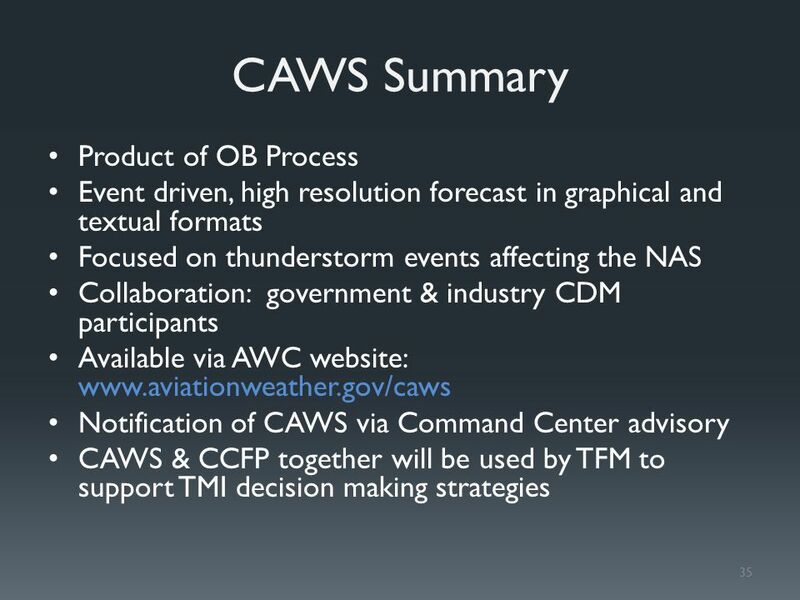 Weather Satellite Data in FAA Operations Randy Bass Aviation Weather Research Program Aviation Weather Division NextGen Organization Federal Aviation Administration.